Mine is Spain, in particular the coastal city of San Sebastian in Northern Spain. San Sebastian is a foodies' paradise, being the birthplace of the famed Basque cuisine. The pintxos bars (the Basque word for tapas) in this city are almost legendary. 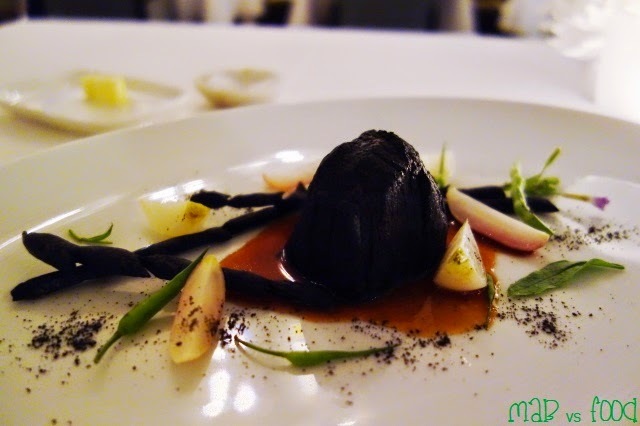 Fine dining lovers are also in for a treat; a trip to San Sebastian will launch you into a galaxy of Michelin stars, as San Sebastian houses a number of the best restaurants in the world. Unfortunately Spain was not a part of my itinerary during my last trip to Europe. But it will definitely be at the top of my list for my next Euro trip! This takes me to the familiar surrounds of est, which hosted the Spanish Inquisition, which was part of March into Merivale. For one night, executive chef Peter Doyle created a 6 course tasting menu (2 entrees, 2 mains, 2 desserts). At $150, this is much cheaper than a return ticket to Spain and no passport is required for this trip! 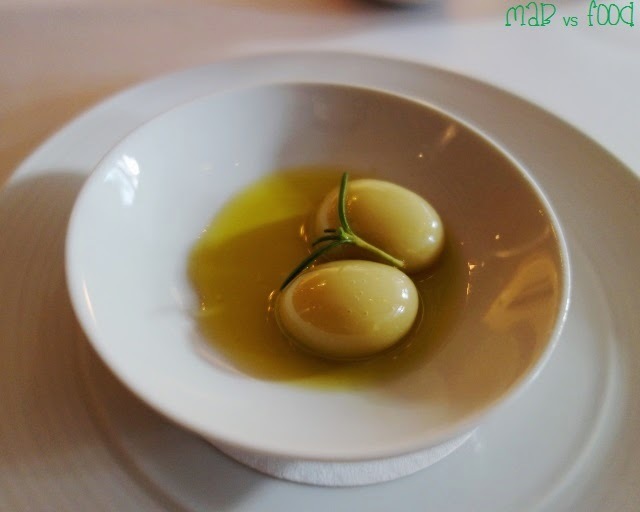 The first starter consisted of 2 spherified green olives sitting in a slick of extra virgin olive oil. These weren't actually olives; they were delicate olive-shaped sacs holding an olive infused liquid. These olives are made by placing drops of the olive liquid into a bath of calcium lactate, which causes a chemical reaction that creates the spherified olives. This is a method that was first coined by Ferran Adria of the now closed El Bulli. What this yielded was an incredible explosion of flavour. The olive bursts as soon as you pop it in your mouth, releasing the wonderful flavours of salty olives and rosemary. 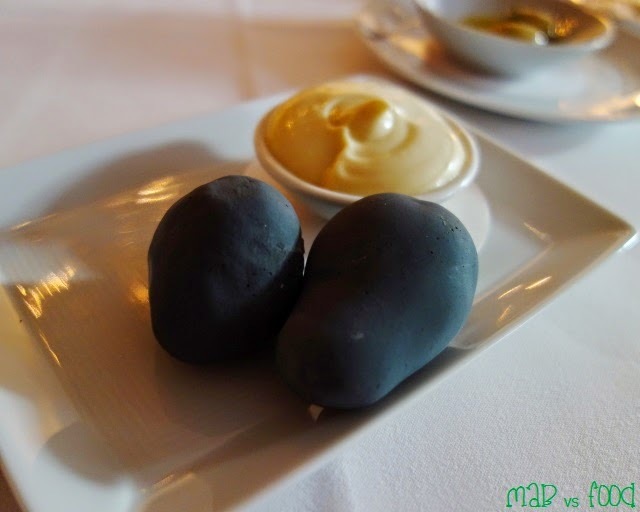 The next starter, looking more like Japanese stones, were charcoal potatoes served with garlic aoli. The potatoes were brilliant: fluffy, yet slightly firm and had a slight smokey flavour. The hero of this starter was the garlic aoli. This is quite possibly the best aoli I have ever had! So creamy, so garlicky so moreish! And I love how there was an extremely generous portion of it. The aoli also made for a delicious spread for bread hehe. 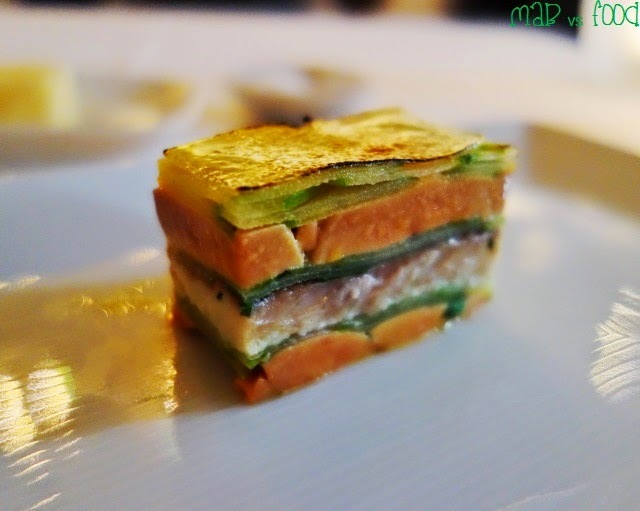 This "mille feuille" is a signature dish of Martin Berasategui, with layers of foie gras, smoked eel, thin slices of green apple and a layer of caramelised green apple on top. This was a beautiful course with all the layers just work together in harmony. The lovely smoked eel and the richness of the foie gras is wonderfully balanced by the freshness of the spring onions and the tartness from the thin slices of green apple and verjus gel on the side. The next course from Quique Dacosta was my favourite savoury course of the night. 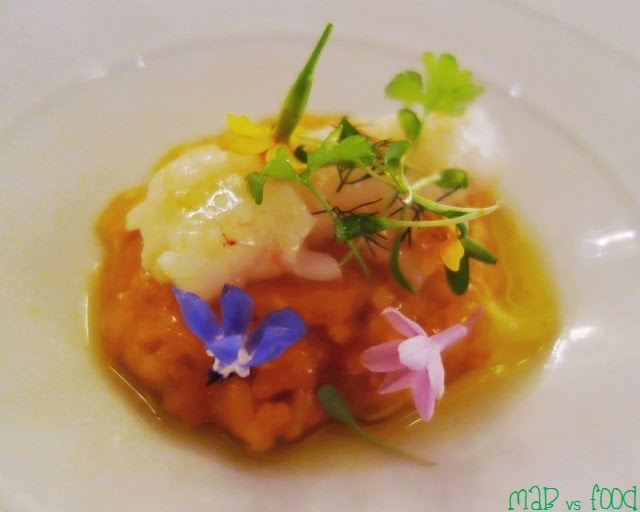 This was a beautifully plated dish of Bomba rice risotto, which was cooked in a tomato and fish stock, coated with a saffron jelly and a butter poached scampi perched on top. The risotto was al dente and had a wonderful depth of flavour from the tomato and fish stock and saffron jelly. But the real star of this dish is the scampi, which the partaking of was worthy of a "foodgasm" moment! The scampi was just amazing: fresh, sweet, succulent and barely cooked, just the way I like it. 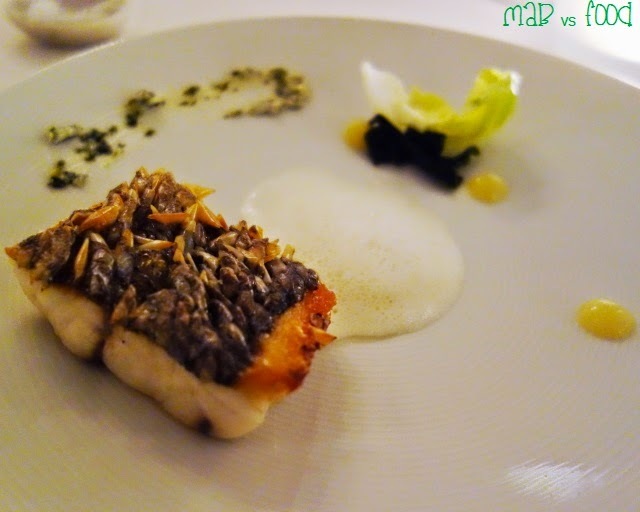 The first main course was a roast mulloway, which looked like a chunk out of a dragon with the scales flicked up. This was an enjoyable course, but it didn't reach the lofty standards set by the starters and the entrees. The crispy scales were the highlight of dish, similar to fried prawn shells in a way. But I did find the mulloway a tad dry. This was compensated by the white chocolate emulsion, which I found to work surprisingly well in a savoury dish. There was a small smidgeon of creamy sauce with capers (kind of like a tartare sauce) that was quite pleasant, but I would have liked more of it. The dabs of lemon gel added acidity to the dish. And I was a bit puzzled by the addition wakame seaweed and lettuce leaf. The final savoury course was an unadorned dish of roast beef covered in vegetable ash, served with vines and radish. On first looks, this looked more like a lump of coal, but once I cut into the beef, I realised that it was a tender and beautifully rare piece of meat. The ash is not overpowering and gives the beef a subtle charred flavour. The jus made from red wine and beef juices was amazing and actually provided most of the flavour in this dish. I am a bit unsure of the side components of black vines, which were made from Grissini bread sticks, and segments of radish. It does make for a striking composition though. The lychee sorbert was an excellent, refreshing pre-dessert. The meringue was interesting and not what I am used to texturally. It was soft, slightly chewy rather than crisp and it was not too sweet. There were also tapioca balls and coconut puree, which I thought went well with the lychee. 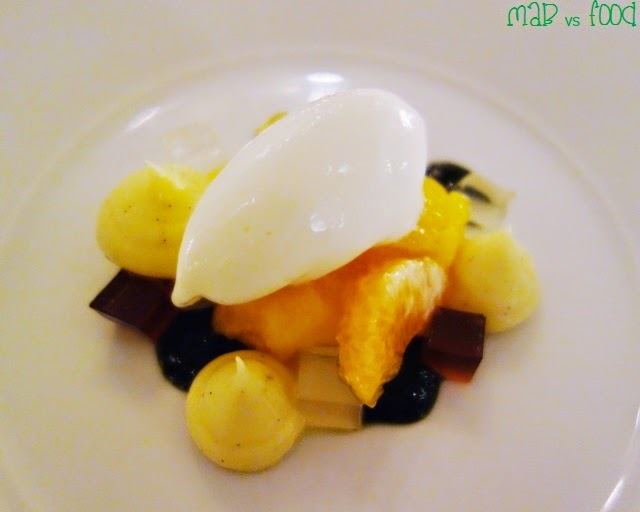 I love the flavour of bergamot and the bergamot ice cream had loads of it, so I was very happy. 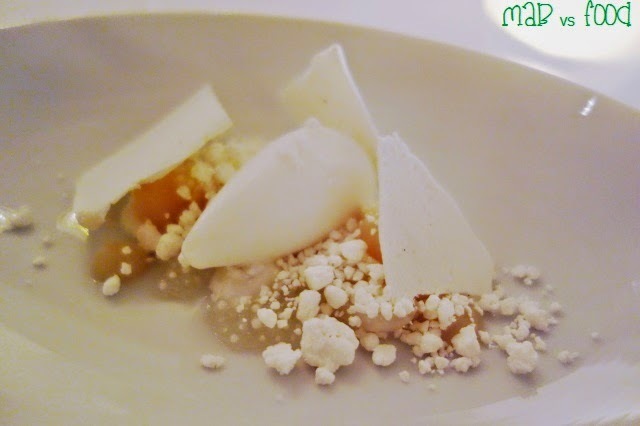 Segments of fresh mandarin and a mandarin sorbet were delicious and added tanginess to the dish. The vanilla creme patissiere was rich and decadent. Then there were two types of jellies: orange blossom with its fragrant and floral notes and maple syrup, which tasted distinctly woody and caramelised. And the most surprising component of all, basil coulis. The sweetness, mintiness and pungency of basil just works brilliantly in desserts. In typical est. 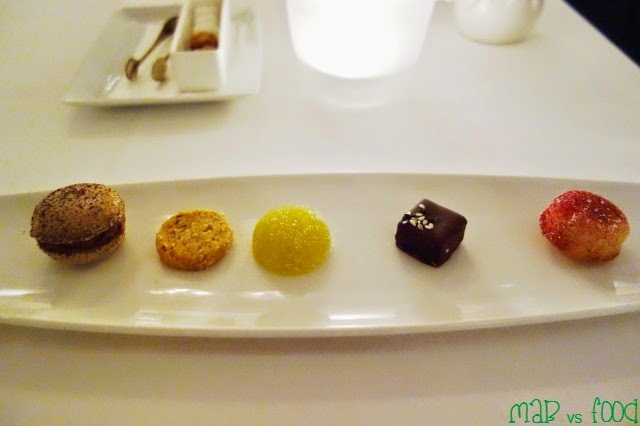 fashion, I finished off a great meal with a selection of beautiful petit fours. There was a malt coffee macaron, a salted hazelnut shortbread, an olive oil and vanilla jelly, a Valrhona chocolate ganache and a lime moelleux cake with dehydrated raspberry. These were all very enjoyable, especially with a pot of tea. The Spanish Inquisition provided me with a taste of the wonderful cuisine of Spanish Michelin star restaurants. But I want the real thing. 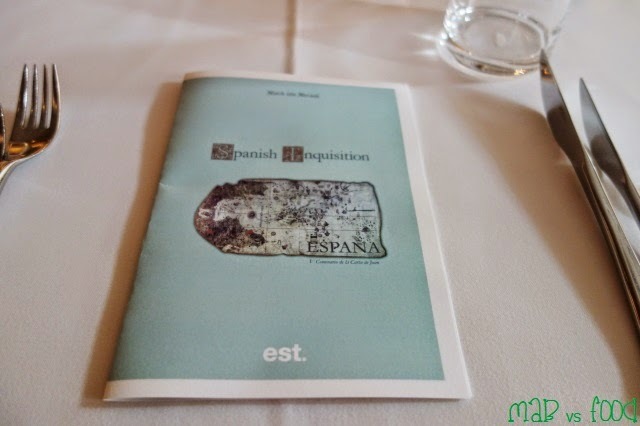 Time to start planning my gastronomic trip through Spain and put San Sebastian at the top of my list of must visit places! Highlight: The scampi in the bomba rice dish. This is the type of cooking that makes est. 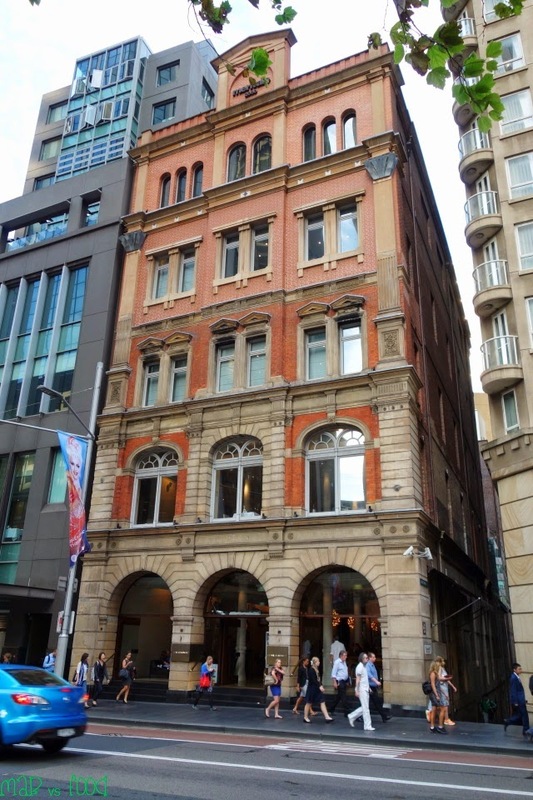 one of my favourite restaurants in Sydney. Can't forget the El Celler de Can Roca dessert either. Lowlight: Although enjoyable dishes in their own right, the meal did take a slight dip with the main courses.